It’s important to create presentations that are both slick and charming—the kind that pull you in and keep you captivated, but in an understated way that helps you focus on what’s actually being said. 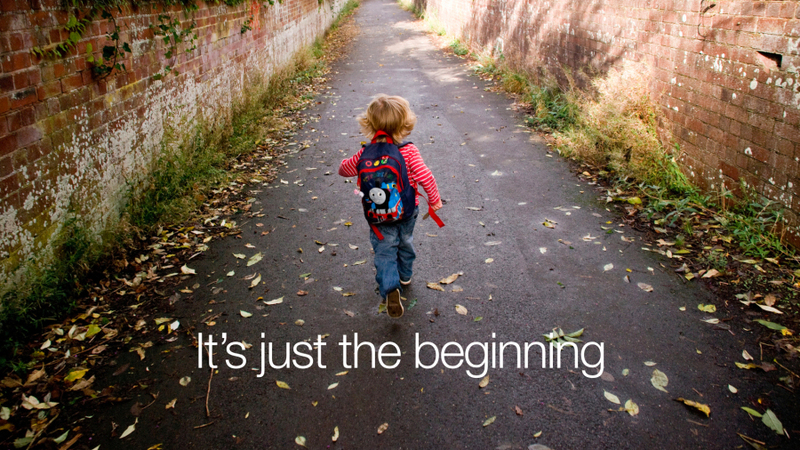 Here, 10 tips for making an effective slide deck. Create a consistent look and feel. In a good slide deck, each slide feels like part of the same story. That means using the same or related typography, colors and imagery across all your slides. Using pre-built master slides can be a good way to do that, but it can also feel restrictive. As designers and artists, people will expect particularly good-looking slides from you. Think about topic transitions. You don’t want each slide to look exactly the same. I like to create one style for the slides that are the meat of what I’m saying, and then another style for the transitions between topics. For example, if my general slides have a dark background with light text, I’ll try transition slides that have a light background with dark text. That way they feel like part of the same family, but the presentation has texture—and the audience gets a visual cue that we’re moving onto a new topic. Use photos that enhance meaning. I love using simple, punchy photos in presentations, because they help what you’re saying resonate in your audience’s mind without pulling their attention from your spoken words. Look for photos that (1) speak strongly to the concept you’re talking about and (2) aren’t compositionally complex. Your photo could be a metaphor or something more literal, but it should be clear why the audience is looking at it, and why it’s paired with what you’re saying. 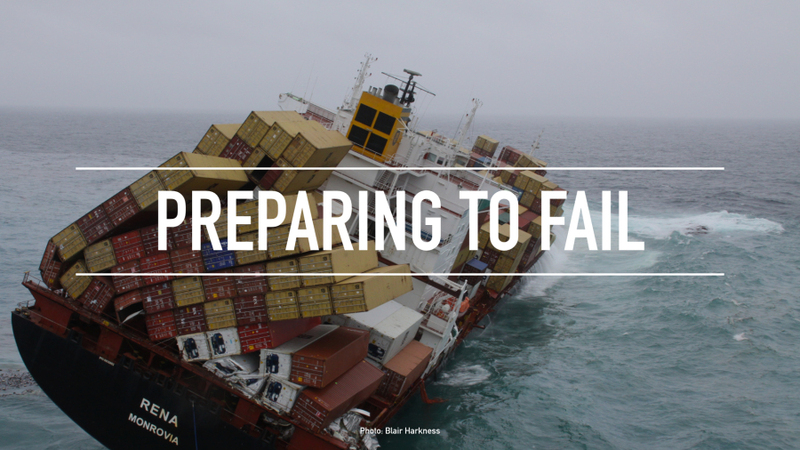 For example, I recently used the image above—a photo of a container ship about to tip over (it eventually sank)—to lead off a co-worker’s presentation about failure preparation. 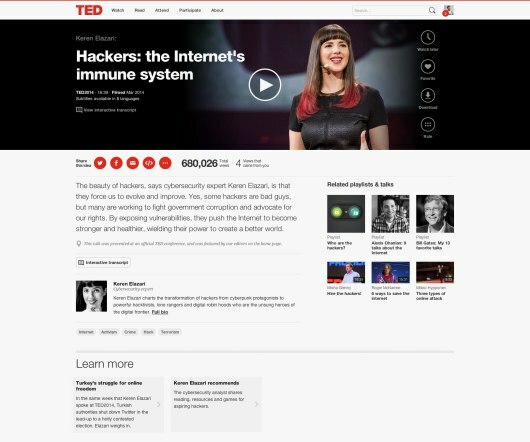 And below is another example of a photo I used in a deck to talk about the launch of the new TED.com. Go easy on the effects and transitions. Prezi and Powerpoint come with a lot of effects and transitions. In my opinion, most of these don’t do much to enhance the audience experience. 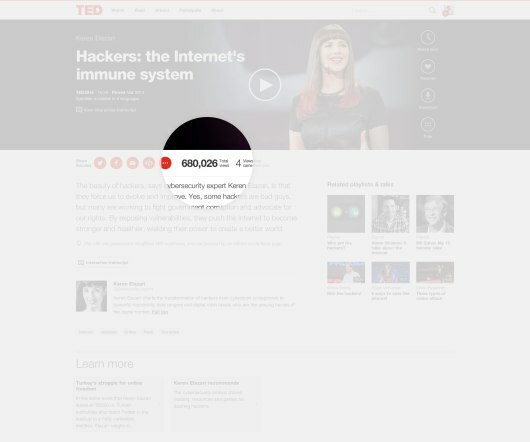 At worst, they subtly suggest that the content of your slides is so uninteresting that a page flip or droplet transition will snap the audience out of their lethargy. If you must use them, use the most subtle ones, and keep it consistent. Use masking to direct attention in images. If you want to point something out in a photo, you could use a big arrow. Or you could do what I call a dupe-and-mask. I do this a lot when showing new page designs, particularly when I don’t want the audience to see the whole design until I’m finished talking about individual components of it. Here’s the original image. NEVER APOLOGIZE. I understand the impulse to apologize. I really do. But the audience does not want to hear it. Don’t apologize for your slides, your talk, your name, your title, you not being the first author, etc. It’s just a waste of time and makes me pay less attention. This is also true if you’re giving a demo and something goes wrong. Even just mumbling under your breath can be distracting, and you’d be surprised how many people never even notice that you clicked the wrong button, etc. Prepare an introduction.You’ve probably prepared your talk, so why haven’t you thought of an opening? I’ve gotten some speaker training, and what the trainers want you to do is write out your opening. You’re not supposed to write the entire talk, just the first few sentences. That helps quite a bit, because you see in writing just how terrible your opening is. But it’s easy to change, and because you’ve written it, you’ll remember. You can also put it on the notes in your presentation (assuming you’re using the presenter view, which you really should).What else to say then instead of “welcome”? How about “Hello!”, “My name is…”, an attention-grabbing quote, the problem you’re hoping to solve or at least discuss, a pithy anecdote, etc. Be sure to quickly move to why are you giving this talk. A strong opening means people will pay attention to you from the start rather than staring into their laptops in the hope that your talk will be over soon. Don’t speak too softly. Even if you can use a microphone; many people think that just because there’s a microphone somewhere in the vicinity, they can just whisper or mumble and it’ll all magically turn into great sound. It doesn’t. Quite the opposite, in fact: your quiet voice sounds shaky and terrible over the loudspeakers. You have to speak into the microphone and project your voice. Not only will the microphone pick you up much better, you sound much better – much more stable and confident. People will pay attention to a loud, clear voice. It can help to breathe deep into your body, and speak from deep in your diaphragm. Most of us talk from our throats, even more so when we’re nervous. But our voices get tense and high when we do, and this isn’t good presentation practice. Discipline the source of your speaking voice, making it richer, and lower in tone. Missing modulation, missing pauses. Many people don’t modulate their voices, and speak too fast. This is usually a sign of a speaker who’s nervous or unprepared. It means that the monotonous sound of your voice is lulling the audience to sleep – or, more likely, becomes background noise to whatever they’re doing on their laptops. Your material is good, and it deserves a slow and authoritative presentation.Instead, do stuff with your voice. Imagine a person of authority – Toni Morrison, perhaps – and channel her voice. You will be amazed at the instantaneous change in your delivery. It doesn’t matter who your muse is – he or she can be famous, or just an impressive professor you once had – but model your delivery on theirs, and begin to learn to how feel that authority and poise in your own body. Raise your voice to point things out. This is important! Look! Pay attention here! Am I asking a question now? Can you tell? See how modulation made all the difference, even with you just reading these words? Another strategy speaker trainers will tell you about is punching words. You punch the important words. Even when they’re not important, you still punch them to keep your audience focused. Beyond this, practice conscious rhythm and pacing. Pacing is essential to effective delivery. If it helps, feel free to write notes to yourself to “pause,” “gesture,” “make extemporaneous comment,” or “look around room.” Master the dramatic pause – It is your friend. Have a closing/summary. Don’t just say, “That’s it!” There is an obvious alternative to that, and it’s a simple “Thank you!” Everybody will understand that that means your talk is over. It’s polite and makes sense. You can also say “Thank you, and I’m looking forward to your questions!” or similar. Couple that with a final slide that has your name, talk title, and contact information, and perhaps even a meaningful image (it’s visualization, use some pictures!) and there won’t be an awkward silence or confusion, just roaring applause.